Now that we’ve got down the basics for making our own yogurt, we’re going to take it to the next level. Your yogurt becomes its finest once it has been strained some (or quite a bit) to remove the whey that makes it so thin. Straining intensifies the yogurt’s flavor, and gives it the body and texture we crave. The more the yogurt is strained, the thicker it becomes. 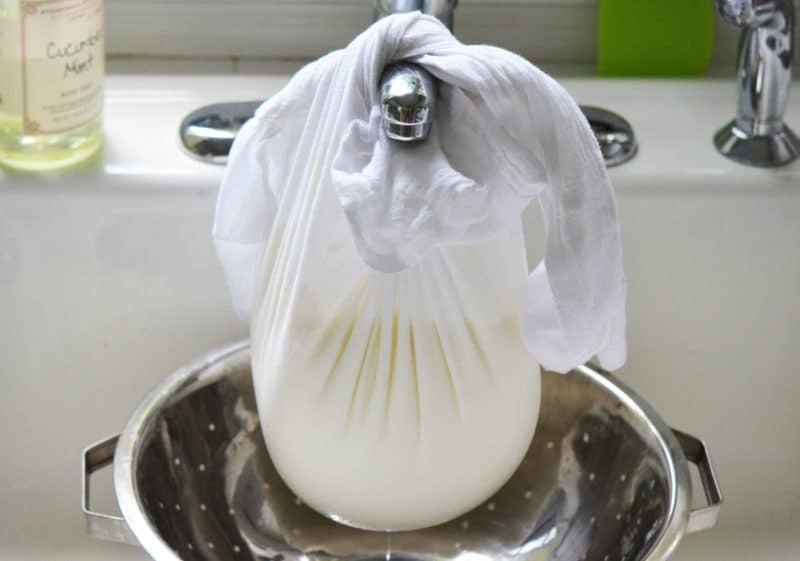 There are a couple of different ways to strain your laban: use a thin muslin cloth, handkerchief, or bread cloth that is hung from the kitchen faucet, Sitti-style, to increase pressure and speed up the draining. Or use any of those cloths to line a strainer that is set in the sink or over a bowl to catch the whey. I’ve come to appreciate, after swearing off of it for a time, the ease of using plain white paper towel lining a strainer to drain yogurt. The strained yogurt practically peels right off of paper towel, whereas with cloth it must be scraped off, and then you have a yogurt-y mess of a towel to wash. My mother always kept a paper towel tucked over her laban in the refrigerator, which soaked up the whey and kept the laban a nice thickness. 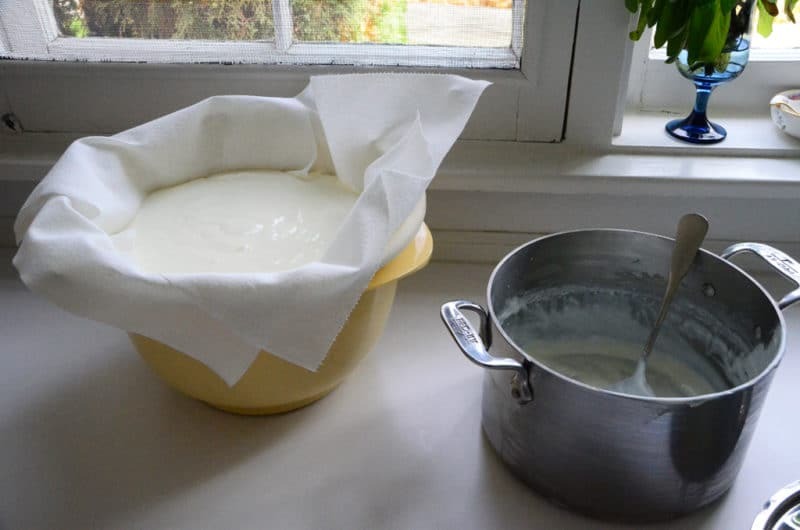 Once your yogurt is strained, and you’ve transferred it from the cloth or paper towel into a bowl, it will need to be whisked for smoothness. Because there is always a layer of yogurt that is dryer closest to the cloth, that layer when mixed with the rest forms lumps in the yogurt. These will decrease substantially when thoroughly and briskly whisked. Add a little cold water to the yogurt to help smooth out the lumps while whisking. Aunt Hilda was known to place her laban in the stand mixer and have at it until she got the smooth consistency she was looking for. If it comes down to it, you can also run the yogurt through a sieve, but I think Aunt Hilda and I are the only ones smooth-obsessed enough to do something like that. Here are straining times (for a towel-lined strainer, as opposed to hung with pressure, which will take less time) and results you can achieve. The yogurt will be fine if left unrefrigerated while it’s being strained (which also contributes to its fermented flavor), but this can also be done under refrigeration. Laban: Slightly strained, 2 hours. I like a slightly strained yogurt for my day-to-day eating, topped with granola or honey or nothing at all, and this yogurt is great for baking and cooking (a full cup in my recent batch of meatballs, mixed with a touch of milk, was an excellent replacement for buttermilk). I always include a good spoonful of laban in the mix when I make hummus, which does the job on creaminess, suppleness. Slightly strained yogurt is the consistency of well-stirred mayonnaise. Labne: Very strained, 6-8 hours. Yogurt strained this long becomes labne, a thick spread. This is what my Sitto ate every single morning on two pieces of buttered toast; she knew how to live. There is no doubt in my mind that I could survive just fine on a diet of labne, kalamata olives, and thin pita bread or Lebanese flat bread (plus dessert). There are very few Lebanese dishes that don’t beg for a dollop of labne to complete the plate: kibbeh (raw, baked or footballs) mujadara, coosa, eggs, shish kebab, hushwe, lubieh, grape leaf rolls…the list is endless. Labne even improves, as cousin Vicky pointed out, chicken soup. Labne also makes wonderful dips for veggies or chips (with mix-ins like dill, cayenne, garlic or scallions), and appetizers—top crostini with labne and roasted tomatoes or roasted red bell pepper, and you are eating well. Mixed with a little milk and seasonings, labne is a cool, creamy salad dressing. Labne preserved in oil: 2 days. This is yogurt-cheese, and it is special. Drain your labne way down to a very thick, cream cheese consistency, which takes a full 24 hours for laban made from ½ gallon of milk (longer for larger amounts). Stir in salt to taste. From this thick labne, form little balls the size of walnuts and place those on a paper towel-lined sheet pan. Then top the balls with another paper towel. Leave them to continue to dry out for another day, changing out the paper towels whenever they get saturated with the whey. Reshape the balls in the palms of your hands to make them even rounder now, then place in a clean jar. 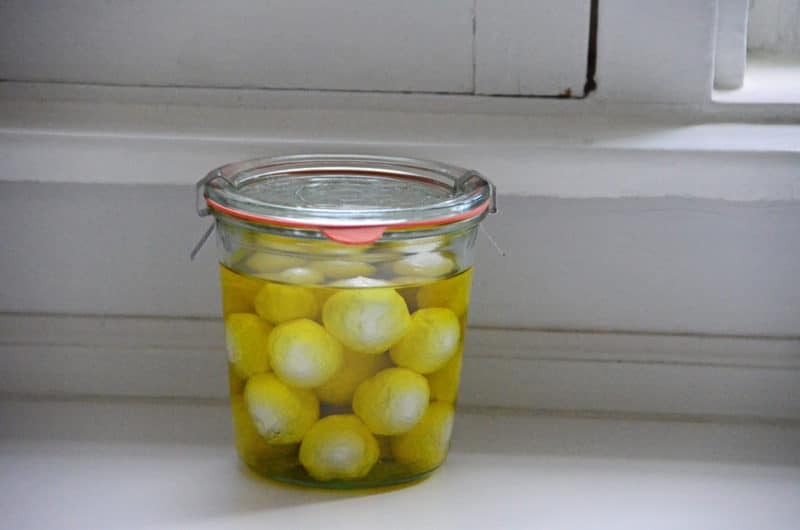 Pour excellent-quality olive oil over the labne balls, cover, and keep refrigerated for many months, up to a year. Eat these topped with their olive oil and za’atar for breakfast, as part of a sophisticated cheese plate with bread or crackers, in a salad as you would goat cheese, or atop crostini like we did with the labne. It’s not uncommon for these labne balls to be flavored with cayenne pepper and eaten spicy. Have you had your fill of yogurt yet? Never! Let me know if you make some and how you like to eat it…I bet you’re going to enjoy adding the laban-making tradition to your own kitchen as much as I have. Print yogurt straining times here. 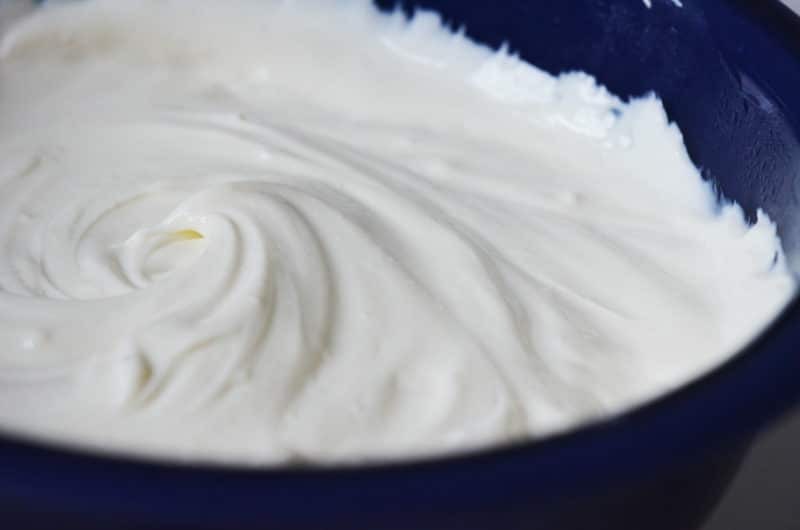 42 Responses to "Homemade yogurt: straining for laban, labne, and labne preserved in oil"
Love labne! No Lebanese child ever gets enough labne so we grow up labne-deprived and craving it! My Mother always tied it to the faucet in a towel to drip all night–which only served to increase a small child’s delight the next morning! I agree with Diane. This post is the BEST!!!! It is soooo mouth watering and the stories bring me back to my Sito’s. Never a day without Laban or Lebane. I recall sitto (father’s side) hanging a large ball over the sink. For some reason though us kids never caught on to liking the labne balls, of course we didn’t get them that often and in Wisconsin regular dairy cheese was very popular. I know, adulteration at best. Jerry, I wonder if we are related. My maiden name is Waken and my father’s family is in Oklahoma. Do you have any connect to any Oklahoma Wakens? Thank you, Maureen for these wonderful recipes so reminiscent of my mother’s cooking. Although I haven’t attempted to make my own laban for some time, you have inspired me to do so when I see how simple and satisfying it can be. 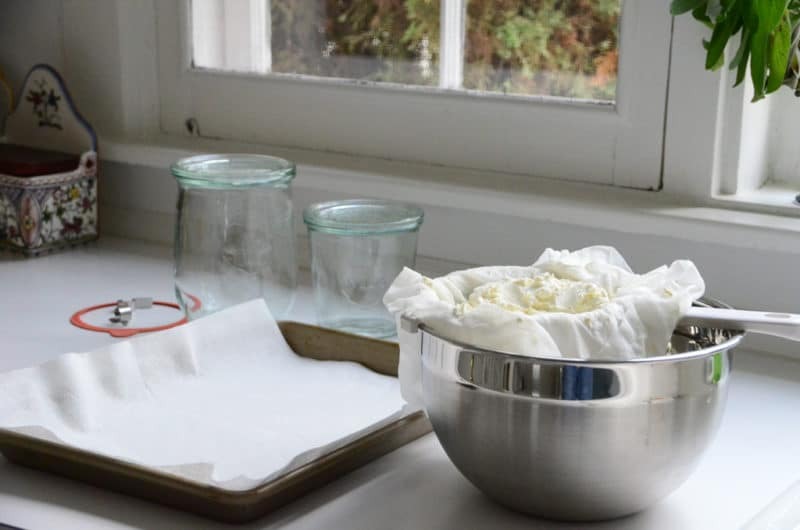 I, too, remember my mother hanging the cheesecloth over a bowl on the kitchen counter and how Mum would save the rawbi each time for the next batch. Living in rural Quebec in the 50’s, one saw very rarely, if at all, commercial yogurt. Maureen….I really enjoy reading your posts, refreshing and enjoyable to read. My mother and father both made the Labnee in our house. I just learned from you. I like mine on the thicker side so I used the paper towel in the strainer and left it in the fridge for 2 days. I emptied the pan 3 times as it produced alot of fluid, however it is still not at the thickness I would like. Any sugggestions for me? I strained my labnee into balls and poured olive oil over it but the oil turned hard in the fridge. What did I do wrong. Maybe my labne still had too much water? Cathy, great that you made these. The oil always hardens when chilled. It will return to liquid quickly if you leave the jar at room temperature for a little while. I live in Dublin, and look forward to trying this recipe. have just discovered your blog through Heidi and 101 cookbooks. How nice Pauline, thank you–and I look forward to seeing you here! This looks fantastic! Could you add garlic or green onion to it? If so, would you do it in the beginning when hanging it or at the end? Absolutely…labne is your blank canvas! Add garlic, green onion, or other stir-ins to labne after it is drained. Great blog. And thanks for posting about labneh. I tried it out last night, however my starting point was greek-style yoghurt. This morning it was a fantastic consistency, just like you would expect from labneh, however I didn’t get the sourness of the real thing. Is it due to the yoghurt (as I suspect), or something else? I used the hang-from-the-tap method. Thanks Ali! The starter plays a huge role in flavor. I always try to start with a rather sour starter since anything else turns out a bland laban. I’ve added a couple of tbsp of lemon and a dash of salt. 90% there. I’ll try a different yoghurt next time, or make my own! Maureen, Thank you so much for this post! 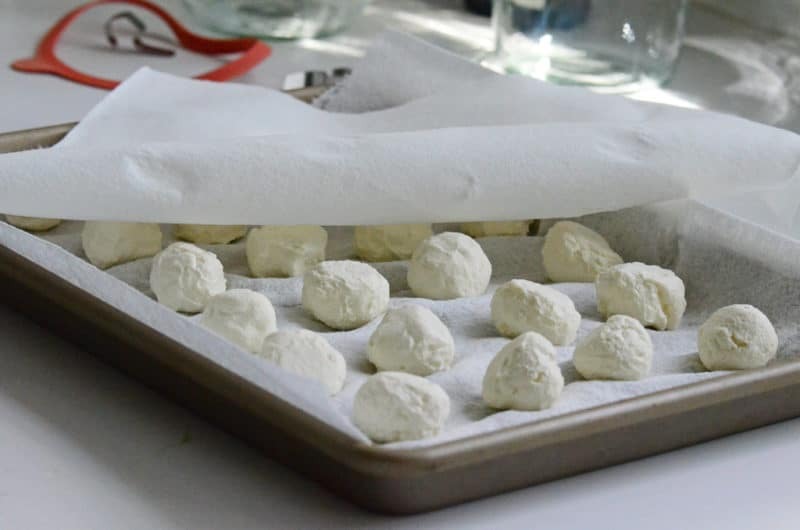 We just tried making Labne balls using our Plain Whole Goat Milk Yogurt. They came out fabulous! We used just a little salt, and added an herb blend that had crushed brown mustard seed, garlic, rosemary, black pepper, Mediterranean thyme, savory, parsley, lavender and sage. Delicious!!! We’ll be making this often! Wow! I can just imagine how delicious your labne is made with your special goat milk yogurt and all of those creative, wonderful spices and herbs. Thank you so much for letting me know about your success making labne balls…how I’d love to come and try them there! Thank you so much for the wonderful detail on these recipes. My yogurt is on its way to becoming laban! On question: I can’t seem to get the tangy taste that I remember from my childhood. Any suggestions? How nice, thank you! That flavor depends a lot on the flavor of your starter, but you can encourage tang by letting the yogurt incubate for a full 24 hours. OMG! OMG! OMG!!!!! I know I sound like a school girl but I don’t care! This is the recipe I’ve been looking for now for almost 10 years!!!! Going to make this next weekend. That’s just the cutest, funniest string of comments you left on a few different posts! I’m so delighted to hear from you and to know you’ve found the recipes. Let me know how it goes! Thank you! Lovely recipe and excellent instructions . Can you tell me how long I can keep my labne in oil in the fridge ? Hi Ann, and thank you–I’ve found it lasts several months if the labne is totally submerged in the oil. Delicious! Diana, this dish is wonderful and will be included in my cookbook! Thanks for your note! I found this page when questioning the directions I have for homemade yogurt. My first attempted batch is (hopefully) doing its thing as I type. My goal is Greek yogurt. Wow! I am so inspired by your information, images, and writing style! I clicked on your home page link and almost cried. Just lovely! Thank you! And, I would love to be your taste-tester, should you ever be in need! I’ve been making yogurt from a friends Jesey cows, heavy in fat. Since I make jellys, I thought to hang the yogurt in them and make laban. SOOOOOO good! I wonder how good it is for you too? Any idea? What is the typical milk to use, goat? Sheep? Hi Louise–in Lebanon the laban is often made with goat’s milk and boy is it delicious, so complex and flavorful! I bet yours is excellent! 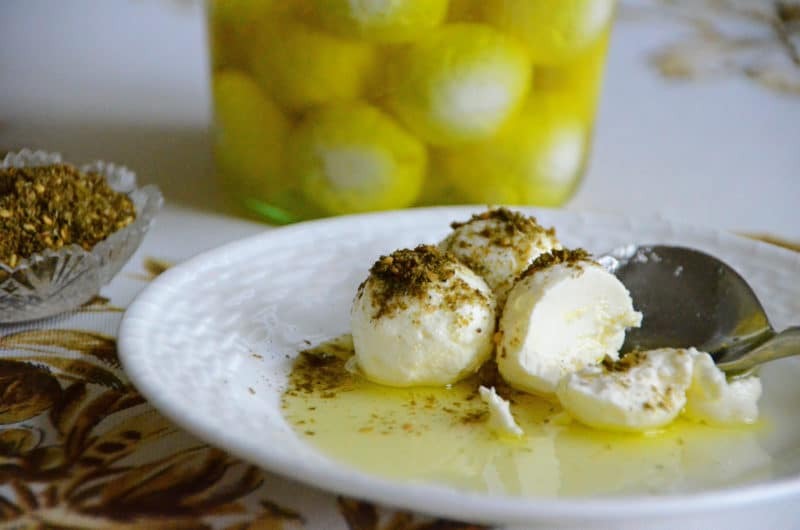 I adore Labneh balls, this recipe looks amazing will definitely give it a try! H,I was wondering if you could preserve the labneh balls in Maple syrup? That’s an interesting idea! I haven’t attempted this or thought of it, but I suspect the labneh would taste delicious with the syrup. Let us know if you do it! Hi Maureen. I like making Laban and have just started making labneh. 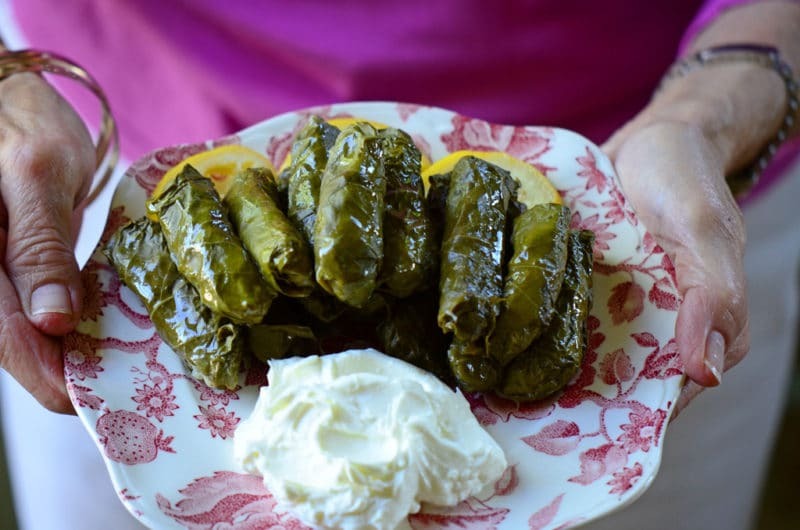 How long can Laban and labneh be kept in the refrigerator. Hi Joyce–I’ve had laban/labneh last at least a month, and often much longer, in an airtight container in the refrigerator. 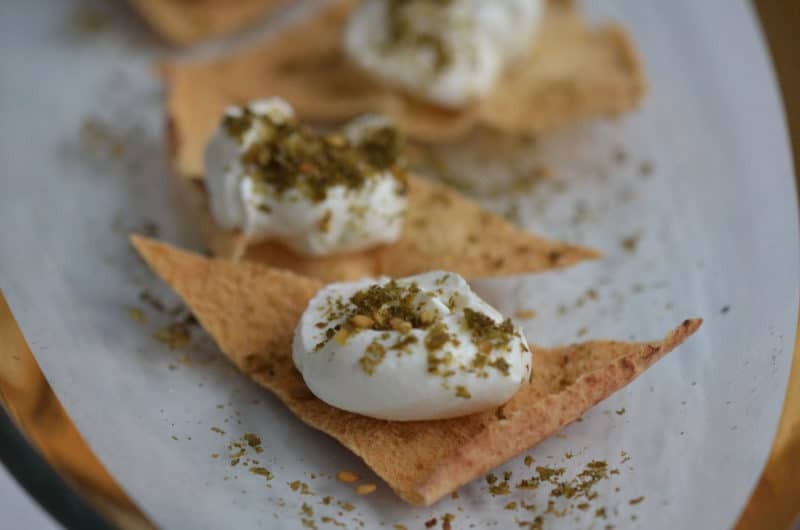 The scent of the laban/labneh should be fresh and still have its tang without any mustiness. Let your nose be your guide! Hi Maureen, I’d like to use my laban as a starter for the next batch… is there a way to control how sweet or tangy it turns out? Hi Eric! If my starter isn’t tangy enough, I often add a squeeze of lemon juice to it and that flavors the new batch nicely. I’m very excited to try this as soon as I get some starter culture to make my laban. Just for my clarification, if you’re straining for labne or to make the cheese balls, should you do this in the refrigerator or will it matter if it’s at room temperature? Thanks for sharing these techniques! You will love making your own laban! Youc an strain at room temperature. I do this in the sink and have left laban out for a full day, which just encourages more fermented flavor. 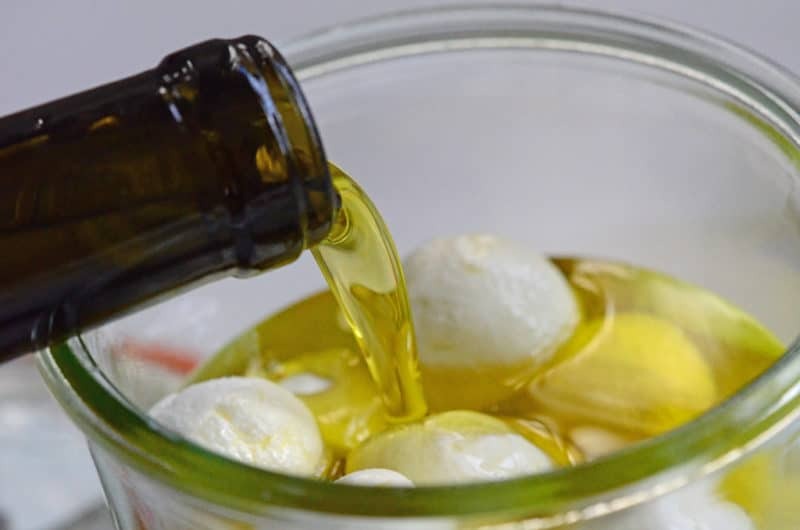 Hello Maureen – When I make the cheese balls at home the olive oil solidifies but when I buy them in the store the oil stays liquid in the refrigerator. What am I doing wrong? Is the store using a different oil or is the oil mixed with water. How do I get the oil to stay liquid like store bought cheese balls? Hi Jen–nothing is wrong! My olive oil always solidifies in the refrigerator. I don’t consider this a problem, because the oil quickly “melts” at room temperature.